WHAT IS A LABRAL HIP TEAR? A labral hip tear is a rupture of the acetabular labrum, which is the cartilage surrounding the socket of the hip joint. This injury is frequently caused by femoracetabular impingement, the unnatural rubbing of the femoral head against the acetabulum; as the bones pinch the surrounding labrum, the resulting friction gradually tears and fragments the labrum. It can also be caused by sudden trauma or any condition resulting in a malformation of the hip such as hip dysplasia. What does a hip labral tear feel like? Common symptoms of a hip labral tear include a pain in the front of the hip or the groin that may extend to the buttocks, a general sense of stiffness, weakness, or instability in the affected hip, a locking or catching sensation while moving, and a limited range of motion. Some patients may also notice a change in their posture or gait. If you think you’re suffering from a labral tear in your hip, an orthopedic specialist can offer a formal diagnosis. 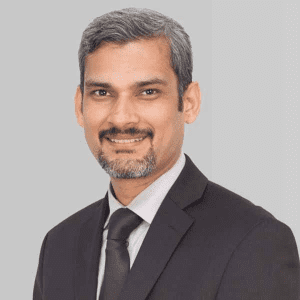 He or she will conduct a short physical examination to assess your hip joint’s range of motion and the extent of any damage by moving the leg around in various directions. If this test is inconclusive, an X-ray can reveal irregularities such as an abnormally positioned joint that might be causing the condition. An MRI arthrogram can also be taken to identify and evaluate the damage to the labrum. This is done by introducing a dye into the joint so that the damage more clearly appears on the MRI. In some cases, injecting lidocaine into the joint can also be used as a means of diagnosing the condition, since this will alleviate pain caused by a torn labrum. WILL A HIP LABRAL TEAR HEAL ON ITS OWN? A labral hip tear won’t heal by itself, but fortunately, most cases respond well to conservative treatment. 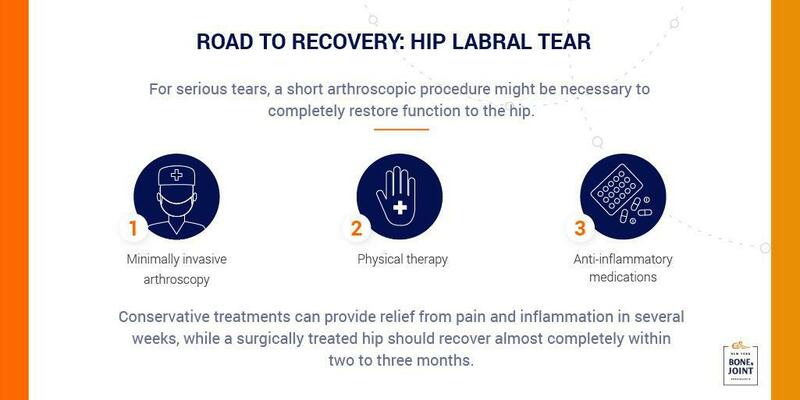 With some combination of physical therapy and anti-inflammatory medications, pain from most labral hip tears should dissipate within several weeks, though minimally invasive labral tear hip surgery may be necessary should the tear not respond to conservative treatment. If you are in pain from a hip labral tear, there are many treatment options available that can get you back on track in no time. Find out about treatment options here. While most labral hip tears don’t require surgery, cases that don’t resolve with conservative treatment might need to be treated with arthrosopic surgery. This minimally invasive procedure prevents damage to the surrounding tissues, resulting in shorter recovery times, reducing pain, and minimizing the risk of complications. During this operation, your surgeon will make several small incisions surrounding your hip, inserting a camera through one of them to view the damaged labrum and operating on it through the other with small medical instruments. Your surgeon will then repair the damaged cartilage, reattaching it to the bone with bioabsorbable anchors to ensure the joint’s stability. While the success rate for labral tear hip surgery is high, you’ll still have some restrictions following surgery. Most patients can walk and engage in low-impact physical activity immediately after surgery, but you’ll need to avoid bearing your full weight on the joint for several weeks. We’ll also connect you with a physical therapist who will follow our detailed rehabilitation program, ensuring proper healing while rebuilding the muscles in your core, legs, and hip. You’ll follow up with your surgeon in the week following the surgery, and then monthly after that to confirm that your recovery is proceeding smoothly. Within eight to twelve weeks, most patients should nearly completely recover, though athletes might experience a slight decline in performance.